On Wednesday, after Patrick Sparkman spotted something in a RAW file that I had sent to him and others, I re-focus fined-tuned my main D850 body with the TC-E14 and the 600 VR, the combo that had been giving the biggest problems in terms of sharpness. Patrick suggested a change in my micro-adjusting techniques and it was a brilliant improvement. I will be sharing that with you here soon. Any hoo, I headed down to the lake and had a great session with the two colts and the two still-small chicks. I was so, so excited as I was sure that the sharpness issues would be gone. But alas, the pudding was spoilt. When I got back to the house I quickly downloaded the images, looked at a very few, and was dismayed to see that all of the images I looked at were soft. So I packed up the 600 VR along with my main TC-E14 and send a 23 pound box off to Nikon Repairs in Melville on Long Island. Late yesterday afternoon, after my swim, I went down to the lake with the 500 PF to make sure that I was still capable of creating sharp images. As you can see below, I can. I was glad to learn yesterday that Ron Owen of Orlando will be joining me at Gatorland on Saturday morning. 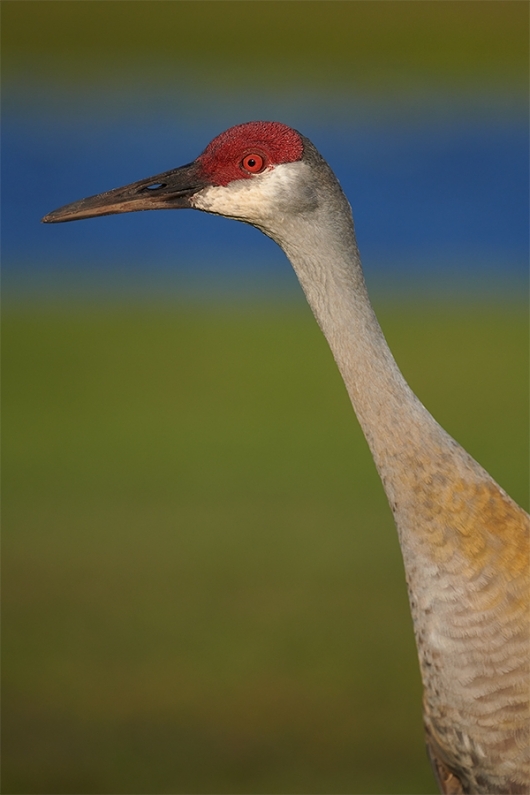 Join me at ILE any Monday, Tuesday, Wednesday (or possibly Friday) morning for the next few weeks to photograph silly tame Sandhill Crane chicks and colts. Best news: there is a third pair on eggs that should be hatching very soon. This image was created at Indian Lake Estates on March 18, 2019. I used the hand held Nikon AF-S NIKKOR 500mm f/5.6E PF ED VR lens and my back-up Nikon D850.. ISO: 500. Matrix metering at zero: 1/2000 sec. at f/6.3 in Manual mode. Auto1 WB at 5:4y pm. One up and to the right of center Group AF was active at the moment of exposure. The array was on the very top of the bird’s neck just below and behind the bird’s cheek. The blue streak in the background is a relatively distant canal. Rest assured that I gave my quadriceps a great workout. Small, even minuscule changes in your position/choice of perspective can have tremendous influence on the success of an image. Had I been even a half inch higher or a half inch lower today’s featured image would have been an insta-delete. My thighs muscles are feeling it this morning, but it was well worth it. Do you like the streak, hate it, or could you care less about it? Artie: I love the muddy blue streak and the muddy green background, so say nothing of the crane’s muddy red crest and the muddy rusty streak on its shoulder. The last one might actually be mud. 🙂 I think the two lessons I’ve learned from you that I apply most often are paying attention to sun angle and paying attention to the background. The color is beautiful. Could there be more space in front of the bill? Maybe making a square image? (Or was there a distractive background there?) The neck makes a lovely diagonal. Hi Artie, I love the blue streak. I think it works really well because of the contrast with the red area on the head. I really like this picture. To me the blue from the canal frames the crane’s head nicely and yes to me makes the picture pop. One of the lessons I’ve learned to pay attention to the background, it may make or break your shot. It’s so easy to be excited about making the shot of the subject that it is relatively simple to miss observing the whole frame, and what a small change may impart to the final capture. Beauty, God Bless…. And yes you still got it! Yes, I’ve learned it from you and your writings. I just don’t get to shoot as often, so it’s like I relearn it every time I get to go out. Kind of a mental checklist of things to do or check on and usually after I’ve rushed into shooting a few shots because it’s always so nice to get out. Hope your lens comes back fixed and ready for bear! Now that you have two camera systems, what factors drive your decision to use the Nikon or the Sony? Is one superior in certain conditions or situations? Thanks. And a good question. I love the SONY for working close with super-tame birds. But remember, right now I am still learning the system. If I was gonna sell one system today I would sell the SONY … Mostly because I have more confidence with my Nikon gear and love, love, love the image quality and the color. As with today’s image. And, I am still unfamiliar with the SONY. But I am not giving up on it just yet. Thanks a stack Ryan. Where do you live? I like the balance in the image with the contrasting green background and the position of the head in the blue, which I assume, is water. Thanks James. Yes, I may have mentioned that the blue was from a relatively distant canal. Thanks a stack Rajit. I love it too and think that the colors rock along with the blue streak. And yes, I have tons of similars with just the green background but like you, I think that this one is very special. When you are in the field, consider the possibilities of getting just a bit higher or just a bit lower or moving a bit left of right; at times, you may come up with something very special. I don’t mind it, but it is the muddy green colour of the blurred foliage that I dislike…. There’s so much of it, so the shot doesn’t ‘do it for me’ at all! Sorry. I’m sure the very nice background “blurred” effect was from some post in PS using Neat Image. I quite like it. Can you confirm Artie? Hi Anthony, You are a day early. The background here is right out of camera … 100% au natural, simply the result of a distant background — getting lower always helps with that, and from being almost wide open with a telephoto lens … See tomorrow’s photo for more on blurring a BKGR. I would never use NI to blur a background, only to reduce noise.